Test your Porsche IQ against the Porsche Museum Historian and the PCA Tech Committee ! 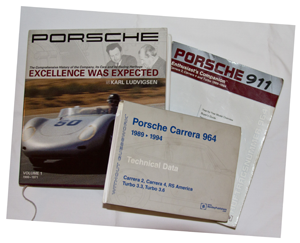 The Technical and Historic Quiz is a written test of your knowledge of general, mechanical and historic aspects of the Porsche family, business and model lines. This year you will be able to test your knowledge with questions from the PCA Tech Committee. There will be (50) General questions that will be the same for all participants. There will be an additional (25) questions for Specific Model Ranges from which you will choose. In addition there will be (5) Tiebreaker questions for everyone that will NOT count in your score, but will only be used to settle tie scores, if they occur. Mens and Ladies Awards for Overall and Model Specific will given. For the Overall Awards the score will be weighted toward the General History and Technical questions and for the model specific awards the score will be weighted toward the Model Specific questions. The questions will be multiple choice, and true/false. The bibliography of publications used for the questions will be posted on the Parade web site two months prior to Parade. Please review the PCA Parade Competition Rules for more detailed information.